After the world ends, how long does it take for the echoes to fade away? John: "We can carry on. We can reach the coast." The Walk is a short film originally released by Eternal Silence, and was later incorporated as the second production in the Wingless Films back catalogue. Directed and shot by Jim Elton, the film stars Tom Menary and María Muñoz Acosta as survivors in a post-apocalyptic wasteland, intent on reaching the coast via a long and hazardous walk. The script for The Walk was completed on 6th May, 2011. The concept was inspired by the 2009 post-apocalyptic film, The Road, adapted from the book of the same name by Cormac McCarthy. Other references include the scene on the car bonnet, underscored by a fan cover of "This Is Gallifrey: Our Childhood, Our Home" by Murray Gold from the Doctor Who: Original Television Soundtrack - Series 3; and the line, "The end of the world. Who'd've thought we'd live to see it?" is from the Star Wars novel Star by Star, by Troy Denning. Katharine's closing voiceover references the last line of F. Scott Fitzgerald's novel The Great Gatsby: "So we beat on, boats against the current, borne back ceaselessly into the past". 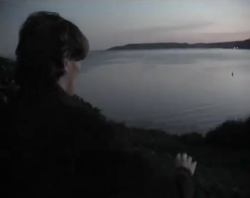 Additionally, John is staring out across the water at a distant light, as Gatsby stares across the bay at a green light at several points throughout the novel. The short was filmed in and around the city of Plymouth in 2010. The opening scene was shot in St. Andrew's Church in the city centre, with permission from the staff. 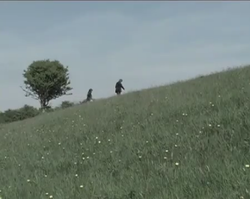 Subsequent exterior scenes were filmed around the Bovisand and Jennycliff areas. The film was scored with public domain tracks composed by Kevin MacLeod and edited by Tom. The Walk was released to the Eternal Silence channel on 26th May, 2011, and was added to the Wingless Films channel for the group's debut on 15th December, 2010. Tom revisited the film's score in December 2012, creating several original tracks as alternative cues. "There's nothing but time! Just time running out...."
"She'll be a child of the sea. We all are. We're floating on deep waters, but one day we'll reach the shore. It might not be perfect, and it might not be all of us, but it's all we can do. We're boats against the current."